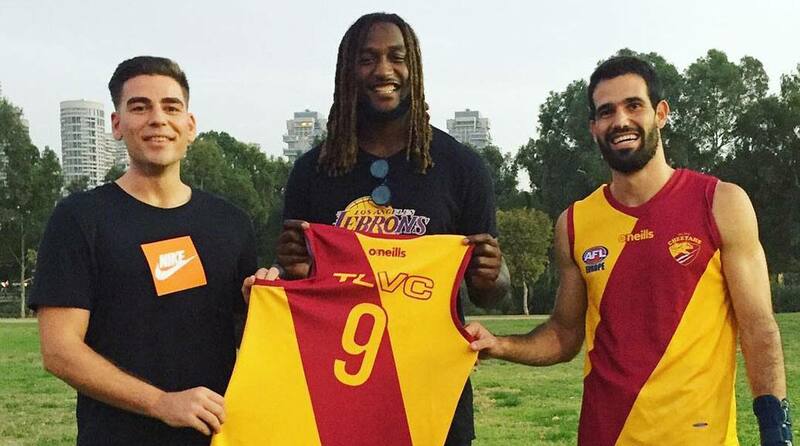 INJURED West Coast star Nic Naitanui worked closely with his fellow ruckmen leading up to the Eagles' premiership and his coaching journey has now taken a more exotic turn, this time to Israel. Naitanui spent Monday night on a bumpy soccer field, conducting training for the Tel Aviv Cheetahs, who play in the AFL Europe competition. Naitanui is in Israel on holiday, and has spent the week travelling through all parts of the country, from the Galilee region in the north, down to Beersheva and the Dead Sea in the south. The 28-year-old has also spent time in Jerusalem and has crossed the border into Palestine, visiting Bethlehem and other holy sites and judging from his Instagram feed, he is having a blast. "Growing up with a pretty strong Christian faith with my family ... and to be able to come and walk in his footsteps ... it was a pretty awesome experience," he told The Four Hoarsemen podcast from Tel Aviv. He was mobbed at the Cheetahs' training session, with more than 50 players attending. The team primarily features locals, plus a smattering of Australian expatriates or visiting students on exchange programs or on gap years. Club captain Shir Shalev said he and his teammates would long remember Naitanui's visit. "The boys were obviously very excited about meeting him and having him come to our pitch for the practice," Shir said. "The first thing you notice about him is how humble he is, and that's really heart-warming considering his impressive career and achievements. "It was a great honour for all of us to meet such a legend." Shir told afleurope.org the words of wisdom Naitanui gave the team would hold it in good stead. "An encounter like this brings a great boost of energy and motivation for all of us," he said. "His visit definitely helped us with spreading the word about the team and attracting new people." While in Israel, Naitanui has maintained his own training as he recovers from the ACL tear in his right knee sustained in July and he hopes to be back playing at AFL level by the middle of next season. "I've started doing a lot of my rehab and cross-training and weights with my leg," Naitanui said. "I start running as soon as I get back from Israel. It's pretty funny. There’s been people hitting me up from all walks of life, so I was actually at a physio this morning doing some exercises and getting some treatment from an Israeli guy who used to reside in Melbourne." The Eagles will be pleased at how sensible he has been; he chose to take a chairlift to the top of the ancient and historic Masada fortress in the Negev Desert, rather than walk the winding and rocky 2km trail to the summit. Unlike Collingwood midfielder Daniel Wells, who infamously blew out while on a pilgrimage to Israel two years ago and who struggled for fitness on his return, Naitanui has been watching his diet. "I think they eat about two kilos of hommus every day," he said. "I've got to stay away from that stuff and the bread as well." "Every meal comes out with about two loaves of bread, so my skinfolds aren't doing too well. Every morning I've been having shakshouka (a spicy egg and tomato dish), so I'm trying to claim it's healthy, but Israeli food is really good but at the same time it's really bad for people like me." There had been suggestions of a photo opportunity with Israeli Prime Minister Benjamin 'Bibi' Netanyahu, because of the similarities of their surnames. "Everyone's calling me 'Bibi' over here," he said.